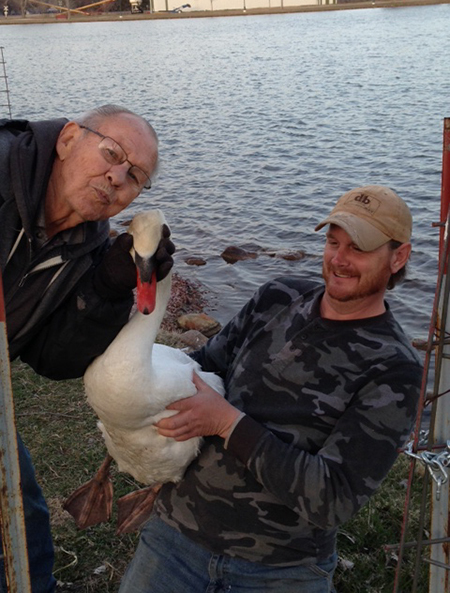 LOCAL SWAN steward Charlie Knigge kisses the surviving swan goodbye as our “swan guy” holds onto him. 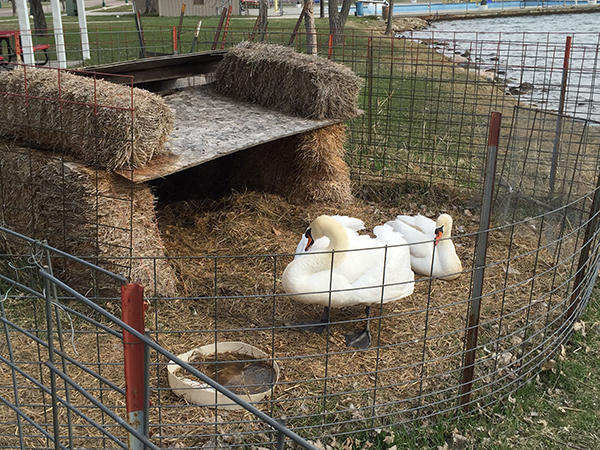 The new swans have arrived, courtesy of the City of Woonsocket, local volunteers and Randy and Lonnie Sharping of the Plankinton area, who raise all sorts of exotic animals and birds. The new pair have been together long enough to have raised a family of cygnets last year, and we were told that they have already started the rituals necessary to provide our town with little cygnets this year. Charlie Knigge, Jeff and Jared Lavine and Brayden Eagle helped round up the single swan left, so Sharpings could come pick it up Monday evening. The new swans will remain in the caged area for approximately one week in order to become acclimated with their surroundings. We are asking the public to please refrain from getting too close to the new swans and nesting area until they can become more accustomed to their new living environment. THE NEW pair of swans arrived Monday and are using the next week to get used to their unfamiliar surroundings. They will be left in their nesting pen until they get acclimated. 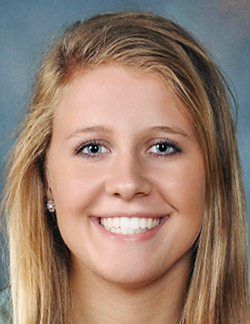 Myah Selland was recently named the Daily Republic girls basketball Player of the Year for her extraordinary season leading the Sanborn Central/Woonsocket Blackhawks to a 21-5 season. This is the second consecutive year Selland has received this award. The Blackhawks spent the season resting on Selland’s shoulders as she hauled them, triple-teamed, all the way to third place in the state. In her junior season, the 6-foot-2 forward, whose exceptional ball handling skills also put her in the guard position at times, averaged 23.8 points per game to break her own team record, set last year. She shot 58 percent from the field for the season. Selland really brought her “A” game in the post season, where she averaged 28.5 points per game and had her career high of 40 points, immediately followed by a 38-point game. Selland also racked up four of her 11 point-rebound double-doubles in the postseason, including a season-high 15 boards. Her game doesn’t stop there, however. Her solid defense and unselfishness on the court also earned her 8.4 rebounds, 3.1 steals, 3.8 assists and 2.3 blocks per game. Selland finished this season with a total of 620 points to boost her career stats to an amazing 1,700 points, with her senior season still to go. She also has a career 751 rebounds and 411 assists. While Selland wants to continue to improve all aspects of her game, she will be forced to slow down in the offseason and miss the summer ball season. She will have to undergo surgery on a nagging hip injury that she says got progressively worse through the season. The break may give her some time to think about the biggest decision she’s ever had to make: where she will attend college. In-state Division I schools have had their eye on Selland for quite some time, but she is also getting interest from some out-of-state schools. Selland says her sister, Shelby, who currently plays for the Augustana Vikings women’s basketball team, is a good source of advice. Shelby worked through a shoulder injury, red-shirting her first year, but was back this year and has been a starter for the Vikings for most of the season. 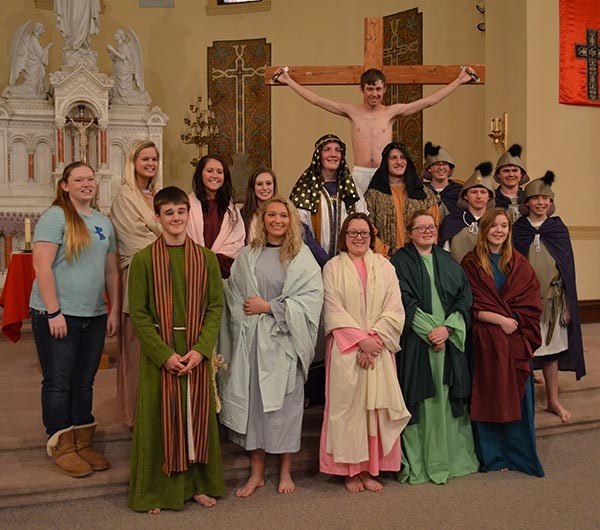 The St. Wilfrid High School Youth Group presented the Living Stations during Holy Week, an enactment of the 14 occurrences experienced by Jesus on his way to the crucifixion. Pictured are the cast: back row, narrator – Erica Howard, Veronica – Tristan Ziebart, weeping women – Callie Bezpaletz and Alissa Ball, Pilate – Shay Swenson, Jesus – Aaron Linke, assistant to Pilate – Jacob Fouberg, guards – Ty Ziebart, Trey Weber, Drew Olinger and Nathan Linke; front row, Simon – Tyler Eddy, Mother Mary – Tayla Weber, Mary Magdelene – Ashleigh Fry, and weeping women – Abi Fry and Alicia Jackson.